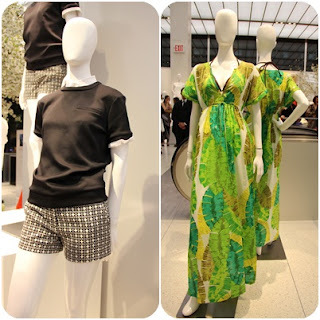 Tonight Joe Fresh held their flagship store opening party at 510 Fifth Avenue at 43rd Street. I had never been in a Joe Fresh store, and as exhausted as I was, I really wanted to check it out. The pop of color everywhere, lighting and open space was enough to wake me up and want to go shopping. The store reminds me of a cross between Uniqlo, Gap and H&M, and pricing is quite affordable. Even more affordable tonight since all party guests were entitled to 25% off. Joe Fresh will open to the public at 12 noon on 3/30, giving away $100 gift cards to the first 200 people. I can only imagine what that line will look like. Happy shopping! Tangerine Tango (Pantone's color of the year) is one of my favorite colors for spring/summer, so I couldn't resist buying this silk colorblock tank for $39 and a pair of link gym shorts for $19 (plus my extra 25% off!). Sizes start at XS, and the fit is pretty true to size. If you plan on shopping Saturday morning at 10am, Joe Fresh will be giving away a free beauty gift, to the first 200 people who spend $50 or more. I'm from Canada and we've had Joe Fresh for years. It's really nothing special. You guys just get the huge store. Here in Canada, Joe Fresh is usually attached to a supermarket (it's owned by Canadian chain, Loblaws). I love their make-up - especially the tinted lip balms though).